Lithograph printed in colors, a fine, fresh impression of the only known state of this rare, early work, the full sheet, printed on BFK Rives, to the edges, signed, dated and numbered in pencil by the artist, pulled in an edition of 50 examples (there were also only 2 known artist proofs,) printed by Chiron Press, New York (now defunct) published by Martha Jackson Gallery, New York, in fine condition, unframed. The New York School artist James Brooks created only 21 known print editions during his career. From 1931 to 1936, Brooks executed 9 black and white lithographs in a Social Realist style, his work reflecting tendencies not dissimilar to that of Thomas Hart Benton and Grant Wood. 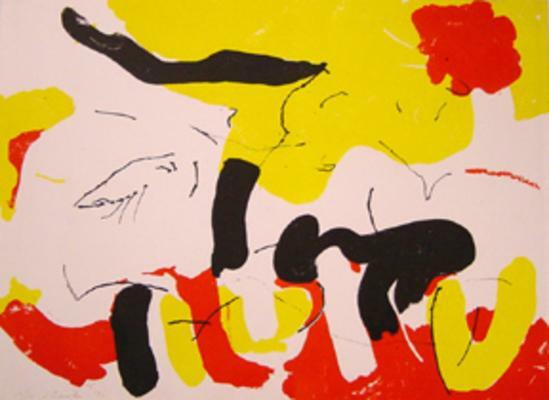 The artist took up printmaking again in 1961, creating only 12 additional print editions in his mature abstract expressionist style until his last edition in 1982. Having suffered from Alzheimer’s disease since 1985, Brooks died at his home in East Hampton, Long Island, in 1992. The present work is from a group of prints published by the Martha Jackson Gallery in 1970, when Brooks was commissioned to create four color lithographs in collaboration with Michael Knigin at Chiron Press in New York. The project was somewhat of a great undertaking for Brooks, as it had been nine years since his first abstract print and he wanted to impress his new dealer, Martha Jackson, whose gallery he had joined in 1968, and who had a very active graphics division run by the dealers son, David Anderson. Although executed during the same time, the prints commissioned by the Martha Jackson Gallery, Ashawagh, Banter, Charbon and the present work, Comac, were not conceived as a set, and they vary in sheet size, edition size, imagery and palette, reflecting the artist's tendency to work simultaneously in different modes. The lithographs evolved from medium-size drawings, and their imagery generally combines poured pigment, gesture and carefully placed calligraphic lines.